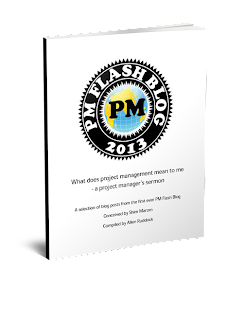 Musings on project management: Do the math! Actually, some of us have. And, probably to everyone's relief it's not one more in a long list of cognitive biases. So, here's the problem: You have two or more predecessor activities (see also: gates, tasks, swim lanes, projects) joining independently to form a finish-to-start dependency on a successor activity. If the predecessors are both/all supposed to finish (or get DONE) at the set time to set off the successor activity, should you worry? Yes, you should. Where the activities merge, like at a gate, there is a bias toward having to shift the schedule to the right (see: schedule slip) in order to maintain confidence in the schedule end date. "Your confidence that the successor can start 'on time or earlier' is 25% or less. Your confidence that the successor task will start late is 75%, or more"
How much earlier? How much later? You don't know from what I've said so far, but you can get a handle on it with a Monte Carlo simulation. So, your challenge as schedule architect is to increase the confidence of the successor F-S. How to do it? Here's an idea: re-architect the schedule from 2 paths to 3 simpler paths, each with higher probabilities on account of their simplicity. Now the graphics for three paths of different probabilities gets too awkward because now you need a figure of 8 (2^3) intersections rather than a figure of 4 (2^2) intersections. Best that you stick with the quantitative probabilities. The joint probability of on-time is their product: 34%, slightly better than the 25% figure of the two lower probability higher complexity paths. Now, of course, this re-architecture can go the wrong way: the improvement in probability has to be fairly large to overcome the three path merge bias. Nonetheless, this option is available for risk managers and schedule architects.